COLUMBUS OH (HJ) - Bruce M. Targe of Hilliard, OH recently tried to buy some wine at his local Gas n’ Sip convenience store. 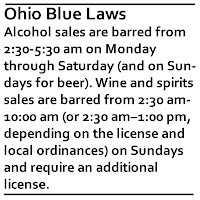 “The wife and I were headed out of town to our cabin and we were stocking up for the week.” He was surprised to find that he could not buy wine on Sundays until 1:00pm due to Ohio’s “Blue Laws” that restrict alcohol sales because of antiquated religious standards. Instead of complaining about it, Mr. Targe decided to take action. He is currently collecting signatures to put forth legislation on what he has christened, “Orange Laws.” In short, Orange Laws would restrict religious services on Wednesdays between 4:30pm and 11:59pm. Mr. Targe explains, “You talk to any religious person and they’ll say that Blue Laws are not that much of an inconvenience. Well, Wednesday night is my bowling night and the mega-church up the road has services at the same time. There’s traffic all up and down the road on the way there and coming back is just as bad when they let out.” By restricting church during that time with an “Orange Law,” Mr. Targe can free up his commute to bowling and show the religious what it is like to be inconvenienced. Pastor Phelps has started his own “Anti-Orange Laws” petition and has gathered 18 signatures. They plan to sell wine and cheese gift baskets to raise money for a continued campaign. You have to approve of the sentiment. Make a facebook page...seriously...I will join. Will Pastor Phelps have his fund raiser before 1:00pm on Sunday? If so, it could be a win-win situation for all.